Scheduled to start production in August 2014, the new plant will support Nissan’s growth strategy in the ASEAN region. The new plant will have an initial annual production capacity of 75,000 units and will expand this up to 150,000 units. 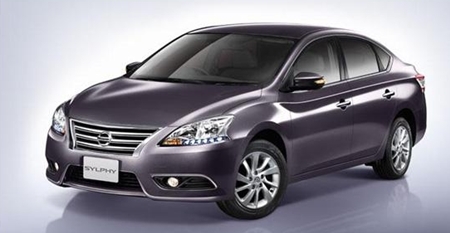 Undoubtedly, the new Nissan Sylphy will have its main SE Asian production base there, and it is already being assembled in China. The new Sylphy has been designed as a global car, and will go on sale in 120 countries, with sales expected to hit 550,000 units annually by 2014. Having seen one on the road, its styling was eye-catching, much more than the Almera, for example, and very much better than the ugly Tiida Latio it replaces in the C-segment. If you are into LEDs, you get a grand total of 54 LEDs including some as day-time running lights with strips in the headlamps, wing mirrors, tail lamps and third brake light. Those who have driven the Sylphy claim the ride is supple and the seats are comfortable, though rear headroom could be a little tight. The new Sylphy hits the Thai market with two engines, an improved HR16DE and a new MRA8DE. The 1.6 liter engine twin C-VTC (Twin Continuously-Variable Timing Control, intake and exhaust) and a class first dual injector fuel system (better fuel spray, two nozzles per cylinder). This DOHC 16v unit turns 116 PS and 154 Nm of torque at 4,000 rpm. Transmission is either a five-speed manual or Nissan’s Xtronic CVT. The top of the range Sylphy has a new 1.8 liter engine paired to the CVT. This produces 131 PS and 174 Nm of torque from a low 3,600 rpm. The suspension is the ubiquitous MacPherson struts up front and a rear torsion beam. Brakes are all discs, but the front units are ventilated. Pricing for the Sylphy starts from B. 746,000 for the base 1.6 MT to B. 931,000 for top of the range 1.8 CVT. The base S spec model still gets dual-airbags but lacks the ABS, EBD, Brake Assist, dual-zone air con, leather, auto headlamps and steering audio/MID buttons which are options further up the range. Top spec cars get keyless entry with boot opener and push to start button, auto fold wing mirrors, wood trim, reverse camera and a USB audio system with Bluetooth and color screen. Obviously enough to get Corolla buyers to look at this as an alternative. But oh that dreadful name! Sylphy. What possesses them? Tiida and that was almost as bad as the Cedric of some years ago. Nissan must have a special stupid names department.